What Is A Big Toe Joint Arthritis? Arthritis of the big toe joint is condition where the cartilage of the big toe joint becomes eroded, leading to limitation of motion and eventually rigidity. Medically this is termed hallux limitus (for limited arthritis) and Hallux rigidus (for severe arthritis). The big toe joint becomes painful, enlarged and inflamed. Patients with arthritis of the big toe joint have varying degrees of symptoms depending on the extent of the arthritis. In general, patients have a painful big toe joint that hurts with activity (such as walking and running). The pain may be deep and sharp to superficial and achy. Movement of the big toe joint can result in a grinding sensation (medically called crepitus). The top of the joint can become enlarged, and this is often referred to as dorsal bunion. Irritation from shoe gear can cause redness and swelling. Motion of the joint becomes limited as time progresses, leading to very limited ability to flex the toe. The two most common causes of arthritis of the big toe joint are biomechanical and traumatic arthritis. Inflammatory arthritis (ie rheumatoid) can occur but tends to be widespread through the body. Gouty arthritis is more common cause of arthritis in the big toe joint. Traumatic arthritis occurs after the joint is injured, leading to further degeneration. Fractures that involve the joint have a high incidence of future arthritis. Injury to the cartilage can also spark the degeneration process. Sprain and strains have been known to also lead to joint degeneration. Biomechanical arthritis occurs from structural problems within the foot that lead to premature ‘wear and tear’ on the joint. Shoe gear can also play a role in arthritis development. Arthritis usually develops slowly over time, with periodic flare ups until a critical point is reached resulting in ongoing pain and discomfort. Common reasons patients seek treatment are: pain, interferes with walking or activities, difficulty fitting shoes, grinding sensation, swelling, and/or notice a change in appearance of the foot and/or toe(s). Depending on your overall health, symptoms and severity of the arthritis, the condition may be treated conservatively and/or with surgery. Non-surgical methods for neuroma are aimed at decreasing and/or eliminating symptoms (pain). A custom foot orthotic is a doctor prescribed arch support that is made directly from a casting (mold) of your feet, and theoretically should provide superior support compared to shoe insert that you would purchase from a pharmacy. In the case of the big toe joint arthritis a stiff forefoot extension may be helpful in reducing symptoms by preventing motion. A intra-articular cortisone injection is a powerful anti-inflammatory medication that is used to rapidly reduce the pain associated with an arthritic joint. The pain relief that you may experience from the injection(s) is often temporary. Surgery for arthritis of the big toe joint is separated into two types of procedures – those that spare the joint (joint sparing procedures) or those that remove the joint (joint destructive procedures). A sparing procedure allows for continued motion with the joint surgically modified or cleaned up of the arthritis to alleviate pain and increase motion. A destructive procedure involves removing the joint and performing a fusion (locking the bone in place) or a joint replacement (allowing for motion, but with an artificial joint). The extent of the arthritis dictates whether or not the joint could be “saved”. Dr. Blitz evaluates each joint carefully, and takes significant measures to prevent joint destructive procedures while still preserving motion and decreasing/eliminating pain. Bone Spur Removal (cheilectomy): This procedure involves removing the arthritic bone spurs and removing any arthritic bone that gets dislodged into the joint. Dr. Blitz also punctures the bone so that newer repair-like cartilage can grow into the joint. Cheilectomy is ideal for mild arthritis of the big toe joint. Although, Dr. 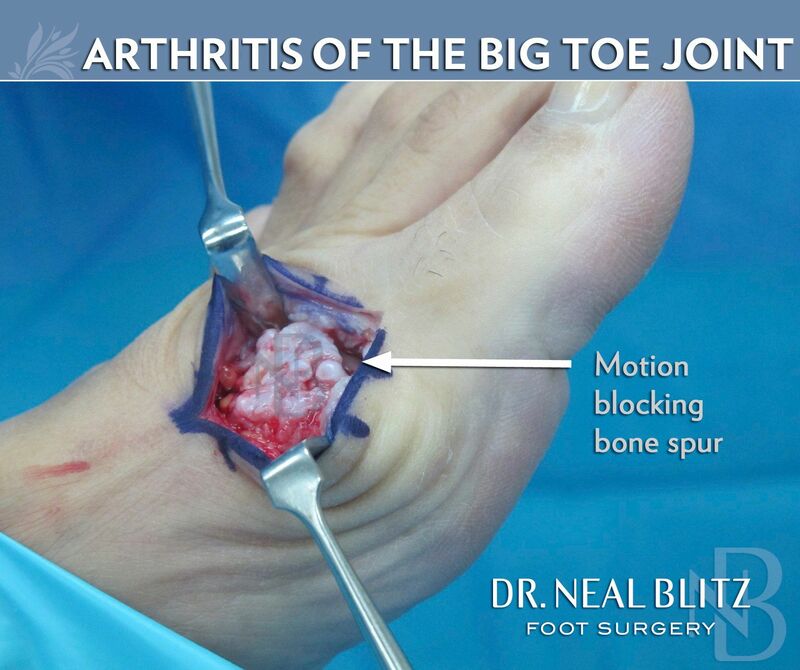 Blitz commonly performs this procedure for severe arthritis, to avoid fusion or replacement. Bone Shortening Procedure (Osteotomy): One method of treating arthritis of the big toe joint is to decompress the big toe joint by shortening the metatarsal bone (the bone that attaches to the toe). The purpose of this is ‘make room’ for the joint to function. This is best for considered for patients who have moderate arthritis with a long bone. Distraction of Big Toe Joint: A surgical procedure that manually pulls on the big toe joint to stretch out the tissue and provide more motion. A small external fixator device is placed onto the big toe joint – through pins placed into the bone. This fixator is slowly distracted and kept in place for several weeks. Dr. Blitz, considers this procedure for patients with significant arthritis where joint destruction procedures are not an option. Cartiva is an FDA approved synthetic cylindrical shaped cartilage replacement implant that replaces the arthritic portion of the big toe joint. The implant itself is a organic-polymer with a high water content similar to healthy cartilage – making it deal for replacement of the arthritic portion of the big toe joint. The surgery involves removing arthritic bone spurs and drilling a small 1-cm hole into the metatarsal bone of the arthritic joint then inserting the Cartiva implant. The Cartiva implant sits slightly proud of the surrounding joint surface, acting as spacer to limit pressure on the joint. The Cartiva implant is durable and does not degrade over time. Its ideal for moderate to severe arthritis. A major benefit of the Cartiva implant is that it does not require significant removal of bone (unlike other joint replacement procedures) so should revision be needed in the future, the repair is less complicated. Fusion of Big Toe Joint: A fusion of the big toe joint involves surgically removing the arthritis cartilage of the joint, and mending the bones together in a functional position for the foot. This surgery is excellent in removing the pain, but the downside is permanent loss of motion as the big toe is locked in one place. Most people, by the time they consider fusion, the toe doesn’t move much, so they are comfortable with that trade-off. Men seem to be more willing for fusion procedures. Women, who wear heels, on the other hand, require some motion of the big toe joint to physically conform into the heels. As such, fusion procedures may not be ideal for women who continue to wear high heels. Either way, fusion is indicated for severe or end stage arthritis. Joint Replacement: Joint replacements are indeed an option for the big toe joint. Advances in recent years have made replacement more function. Other joints, such as hip and knee, have excellent functional track records, where as joint replacement of the big toe joint is limited. This is because the big toe joint is small (compared to other joint) and demands the pressure of the entire body during a propulsive gait – as such the joint replacements wear out quickly. Nonetheless, there are options for partial replacement, total replacement, and even metallic resurfacing of the joint. Dr. Blitz considers each patients functional need when considering replacements, but are best considered only with significant arthritis. Recovery after big toe joint arthritis surgery is varies depending on the method chosen to fix the problem. Most often patients are allowed to walk in the foot. Minor procedures (such as bone spur removal and Cartiva), patients are walking in a regular shoe in 1-2 weeks. When bone cuts are performed, patients have more restrictions and may be walking in a surgical shoe for 6 weeks or so. When fusion is necessary, Dr. Blitz is able to allow immediate walking after the operating room in a protective boot for 6 weeks (until the bone mends). Joint replacement surgery can be more involved depending on the extent of the procedure, but often are walking in a protective boot. Big Toe Arthritis surgery is performed as outpatient surgery (this means you go home the same day). It may be performed in a hospital, ambulatory surgery center and even in the doctors office (so long as the facility is set up for surgery). Morton’s Neuroma surgery complications include, but are not limited to: infection, pain (temporary or permanent), swelling, hematoma, bleeding, blood clot, poor wound healing, incision breakdown, poor bone healing (delayed union, nonunion), malunion, nerve injury, neruoma, pain syndrome, RSD, disability, recurrence, flail toe, hammer toe deformity, metatarsalgia, unsightly scar, stiffness, shortness of toe, weakness in toe, loss of toe to purchase ground, hardware problems, need for revisional surgery, and/or catastrophic loss.